The United Nations (or simply UN) is an international organization established in 1945 for the purpose of securing world peace. It replaced its predecessor, the League of Nations, which had failed to prevent war between nations. It was founded by 51 nations led by the allied powers after World War II. Now with 193 members, the organization's structure still reflects the geopolitical circumstances at its founding. On the United Nations Security Council, the body with the ability to enforce its decisions, there are five permanent members (P5) with veto power—the United States, Russia, the United Kingdom, France, and the People's Republic of China (PRC). Neither Russia nor the PRC were originally permanent Security Council members but took over the seats of the Soviet Union (defunct since 1992) and Republic of China (UN membership withdrawn in 1971). As an organization of governments designed to prevent war between states, it has struggled to address issues of civil and ethnic strife within countries. Since the end of the Cold War, trends in conflict have shifted from international to intra-national conflicts; nations are no longer the defining framework for conflict. The United Nations Security Council, the UN's enforcement tool, has had to cope with intra-state and non-state threats by expanding the jurisdiction of its authority, although some question the suitability of the UN intervening in internal conflict situations. At the UN today, issues are still dealt with in the context of relations between nations, though they are often common problems within states. Many of the governments that make up the United Nations are dictatorial or authoritarian regimes that have been imposed by force, and do not reflect the interests of the majority of their people. As a result, a sizable number of the world's peoples feel they have no representation in the United Nations. Proposals have been made to reform the UN to give non-governmental organizations (NGOs), religious leaders and other members of civil society who represent or deal better with disenfranchised people, a greater role in the United Nations. International security has traditionally been guaranteed by an arrangement of great powers. After the Napoleonic Wars, the Concert of Europe, consisting of France, the United Kingdom, Russia, Austria, and Prussia, created a period of international security and a climate for economic development in Europe. After World War II, the United States, the Soviet Union, France, China, and the United Kingdom were the five great powers which made up the security backbone of the United Nations. The ideas for international law go back to the Roman Empire, and Hugo Grotius, who integrated a moral component to the traditional "Law of Nations" in his On the Laws of War and Peace (1625). He is considered the founder of modern international law. The ideas for a federation of nations are frequently traced to the nineteenth-century philosopher Immanuel Kant and his book Perpetual Peace (1795). International resolution of disputes was first addressed by a Permanent Court of Arbitration established at the Hague Conference in 1899. Participation was voluntary and it did not solve problems of national aggression. After World War I, the League of Nations was established as a world organization to promote collective security, disarmament, and a legal approach to resolution of disputes. However, many nations, especially the United States, never joined the league and it became powerless to act against Italian aggression against Ethiopia in 1935, or to prevent the outbreak of World War II. The United Nations was designed to address the known shortcomings of it predecessors. The term "United Nations" was coined by President Franklin D. Roosevelt, during World War II, to refer to the Allies. Its first formal use was in the January 1942 Declaration by the United Nations, which committed the Allies to the principles of the Atlantic Charter and pledged them not to seek a separate peace with the Axis powers. Thereafter, the Allies used the term "United Nations Fighting Forces" to refer to their alliance. Roosevelt, in the midst of a two-front war, yearned to form a new international organization, led by the great powers, because of the failure of the League of Nations. He believed that participation of all the great powers—great power unanimity and responsibility—was the key to success of this new organization. Roosevelt also wanted to maintain the Soviet Union's goodwill as it had not only borne the brunt of the fighting in Europe, but was thought necessary to join the war effort in the Pacific in order to bring about Japan's earliest possible defeat. Roosevelt, adamant in wanting full great power participation for a postwar united nations, acquiesced in the Russian installation of satellite states as its troops conquered German forces in Eastern Europe; Soviet dictator Josef Stalin alleged creating this "buffer zone" was now required for Russian security. The idea for the United Nations was elaborated in declarations signed at wartime Allied conferences in Moscow, Cairo and Tehran in 1943. From August to October 1944, representatives of France, the Republic of China, the United Kingdom, the United States, and the Soviet Union met to elaborate the plans at the Dumbarton Oaks Conference in Washington, D.C. Those talks were productive but inconclusive, and were followed by the Yalta Conference (a meeting of the U.S., U.K., and USSR in the Crimea) in February 1945, which produced proposals outlining the purposes of the organization, its membership and organs, as well as arrangements to maintain international peace and security and international economic and social cooperation. The organization proposed has many of the characteristics of a military alliance of a few great powers. Certain provisions seem to envisage a division of the world into regional spheres of influence dominated by one or another of the great powers. Reliance is placed primarily on force unrelated to any explicitly agreed upon principles of justice. Further, the proposed organization should be more adequately endowed with curative functions needed to deal with the causes of war and with creative functions needed to draw the nations together in fellowship. It has been suggested that religious organizations sought to include universal elements in the thinking and language that led to the final United Nations Charter, but in the end, language that referred to the fundamental bases of building peace, especially with religious connotations, was removed in order to appease the Soviet Union. It was at Yalta that the voting procedure of the United Nations Security Council was agreed upon. Although at Dumbarton Oaks, it was generally agreed that permanent members of the Security Council could exercise a veto; Roosevelt, British prime minister Winston Churchill and Stalin at Yalta decided the five permanent members (including France and China) could veto anything other than procedural issues. Having secured Stalin's agreement to participate in the United Nations, Roosevelt then accepted that the USSR be given three votes in the United Nations General Assembly: one for the USSR itself, and one each for the Soviet socialist republics of Ukraine and Byelorussia (now Belarus). The Soviet Union thus gained the ability to veto future UN Security Council resolutions as the price of its entry into the UN, as well as gained two additional General Assembly seats. Overall, the emerging UN appeared to be a great power creature bent to meet Soviet security demands and insistence that a few great powers be able to swiftly make decisions and carry them out. This understandably gave the impression to many that the UN was going to be less a viable peacemaking institution and more a vehicle for great powers to maintain peace through spheres of influence. On April 25, 1945, the United Nations Conference on International Organization began in San Francisco with delegates from 50 nations. Some civil society representatives did participate in delegations, but in the end, significant input of civil society and religious organizations in particular, in the UN's inception appears to have been negligible. Apart from, but during the San Francisco Conference, further bilateral discussion on the use of the Security Council veto took place between the U.S. and Soviet Union, which paved the way for full Soviet acceptance. The 50 nations represented at the conference signed the Charter of the United Nations two months later on June 26. Poland, which was not represented at the conference (but for which a place among the original signatories had been reserved) added its name later, bringing the total of original signatories to 51. The UN came into existence on October 24, 1945, after the charter had been ratified by the five permanent members of the Security Council and by a majority of the other 46 signatories. Initially, the body was known as the United Nations Organization (UNO), but by the 1950s, English speakers were referring to it as the United Nations, or UN. The UN describes itself as a "global association of governments facilitating cooperation in international law, international security, economic development, and social equity." As of 2017, it consists of 193 member states and 2 observer states, including virtually all internationally-recognized independent nations. The UN is headquartered in Manhattan, New York City, United States. The organization is divided into administrative bodies, including the UN General Assembly, UN Security Council, UN Economic and Social Council, UN Trusteeship Council, UN Secretariat, and the International Court of Justice, as well as specifically created international bodies dealing with international problems, for example, the World Health Organization (WHO), the International Atomic Energy Agency (IAEA), and United Nations Children's Fund (UNICEF). The organization's most visible public figure is the Secretary-General, currently Ban Ki-moon, who assumed office in January 2007. 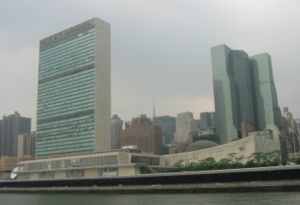 The United Nations Headquarters building was constructed on Manhattan Island in 1949-1950 beside the East River on land purchased by an $8.5 million donation from John D. Rockefeller, Jr., and designed by architect Oscar Niemeyer. The complex officially opened on January 9, 1951. While the principal headquarters of the UN are in New York City, there are major agencies located in Geneva, The Hague, Vienna, Bonn, Bangkok, and elsewhere. The six official languages of the United Nations include those of the founding nations: Chinese, English, French, Russian as well as Spanish (UN Charter, Article 111) and Arabic (S/RES/528 (1982)). All formal meetings and all official documents, in print or online, are interpreted in all six languages. UN membership is open to all states that accept the obligations of the UN Charter and, in the judgment of the organization, are able and willing to fulfill these obligations. The General Assembly determines admission upon recommendation of the Security Council. The United Nations Security Council is the most powerful organ of the United Nations. It is charged with maintaining peace and security between nations. While other organs of the UN only make recommendations to member governments, the Security Council has the power to make decisions that member governments must carry out under the United Nations Charter. A decision of the council is known as a resolution. Since 1965, the Security Council has been composed of the original five permanent members (P5)—the U.S., U.K., France, Russia, and China—plus ten non-permanent members. Non-permanent members serve for two years, five elected each year by the General Assembly, and are chosen to achieve equitable regional representation. The United Nations General Assembly is made up of all United Nations member states and meets in regular yearly sessions, beginning in September, and in special sessions, under a president elected annually from among the representatives of five regional groups of states. As the only UN organ in which all members are represented, the assembly serves as a forum for members to express official government positions, launch initiatives on international questions of peace, economic progress, and human rights. It can initiate studies, make recommendations, develop and codify international law, promote human rights, and further international economic, social, cultural, and educational programs. The United Nations Secretariat is headed by the United Nations secretary-general, who is assisted by a staff of international civil servants worldwide. It provides studies, information, and facilities needed by United Nations bodies for their meetings. It also carries out tasks as directed by the UN Security Council, the UN General Assembly, the UN Economic and Social Council, and other UN bodies. The United Nations Charter provides that the staff be chosen by application of the "highest standards of efficiency, competence, and integrity," with due regard for the importance of recruiting on a wide geographical basis. The term of office of the secretary-general is five years, elected by the General Assembly on the recommendation of the Security Council (closed session "straw votes" of candidates for secretary-general usually precede the council's formal recommendation). Most often, a secretary-general can be re-elected to a second five-year term. 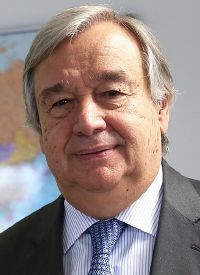 The current Secretary-General is António Guterres, who replaced Ban Ki-moon in 2017. The secretary-general's duties include helping resolve international disputes, administering peacekeeping operations, organizing international conferences, oversight of the implementation of Security Council decisions, and consulting with member governments regarding various initiatives. Key Secretariat offices in this area include the Office of the Coordinator of Humanitarian Affairs, the Department of Peacekeeping Operations, and the Department of Political Affairs. The Economic and Social Council (ECOSOC) of the United Nations assists the General Assembly in promoting international economic and social cooperation and development. ECOSOC has 54 members, 18 of whom are elected each year by the General Assembly for overlapping three-year terms. The president is elected for a one-year term. Each member of ECOSOC has one vote, and decisions are made by a majority of the members present and voting. ECOSOC meets once a year in July for a four-week session. Since 1998, it has held another meeting each April with finance ministers heading key committees of the World Bank and the International Monetary Fund (IMF). Viewed separate from the specialized bodies it coordinates, ECOSOC’s functions include information gathering, advising member nations, and making recommendations. ECOSOC seeks advice from non-governmental organizations (NGOs) and has granted many NGOs consultative status. ECOSOC is well-positioned to provide policy coherence and coordinate the overlapping functions of the UN’s subsidiary bodies and NGOs. The United Nations Trusteeship Council was established to help ensure that non-self-governing territories were administered in the best interests of the inhabitants and of international peace and security. The trust territories, most of them former mandates of the League of Nations or territories of nations defeated at the end of World War II, have all now attained self-government or independence, either as separate nations or by joining neighboring independent countries. The last was Palau, which became a member of the United Nations in December 1994. Its mission fulfilled, the Trusteeship Council suspended its operation on November 1, 1994, although under the United Nations Charter it continues to formally exist. The International Court of Justice (ICJ) (also known as the World Court) is the principal judicial organ of the United Nations, located in the Peace Palace at The Hague, Netherlands. Established in 1946 as a successor to the Permanent Court of International Justice under the League of Nations, its main functions are to settle disputes submitted to it by states and to give advisory opinions on legal questions submitted to it by the General Assembly or Security Council. A related court, the International Criminal Court (ICC), began operating in 2002 through international discussions initiated by the General Assembly. It is the first permanent international court charged with trying those who commit the most serious crimes under international law, including war crimes and genocide. The ICC tries those who could not be brought to justice by their own people, given that the ICJ was created to handle only inter-state cases. The assembly has established the principle that the UN should not be overly dependent on any one member to finance its operations. Thus, there is a “ceiling” rate, setting the maximum amount any member is assessed for the regular budget. In December 2000, the assembly agreed to revise the scale of assessments to make them better reflect current global circumstances. As part of that agreement, the regular budget ceiling was reduced from 25 to 22 percent; this is the rate at which the United States is assessed. The United States is the only member that meets that ceiling; all other members' assessment rates are lower. Under the scale of assessments adopted in 2000, other major contributors to the regular UN budget for 2001 are Japan (19.63 percent), Germany (9.82 percent), France (6.50 percent), the United Kingdom (5.57 percent), Italy (5.09 percent), Canada (2.57 percent), and Spain (2.53 percent). Special UN programs not included in the regular budget (such as UNICEF, the United Nations Development Programme (UNDP), the United Nations High Commissioner for Refugees, and the World Food Programme are financed by voluntary contributions from member governments. The member countries of the UN and its specialized agencies—the "stakeholders" of the system—give guidance and make decisions on substantive and administrative issues in regular meetings held throughout each year. Governing bodies made up of member states include not only the General Assembly, the Economic and Social Council, and the Security Council, but also counterpart bodies dealing with the governance of all other UN system agencies. For example, the World Health Assembly and the Executive Board oversee the work of the World Health Organization. Each year, the U.S. Department of State accredits delegations to more than six hundred meetings of governing bodies. The 1945 UN Charter envisaged a system of regulation that would ensure the "least diversion for armaments of the world's human and economic resources." Ironically, the first use of nuclear weapons came only weeks after the signing of the Charter and provided immediate impetus to concepts of arms limitation and disarmament. In fact, the first resolution of the first meeting of the General Assembly (January 24, 1946) was entitled "The Establishment of a Commission to Deal with the Problems Raised by the Discovery of Atomic Energy" and called upon the commission to make specific proposals for the "elimination from national armaments of atomic weapons and of all other major weapons adaptable to mass destruction." In 1957, the International Atomic Energy Agency (IAEA) was established in conjunction with the United Nations to help both with peaceful uses of atomic energy and to monitor the proliferation of nuclear materials for weapons of mass destruction. The IAEA is presently focused on Iran's nuclear program and the dismantling of North Korea's. The UN has established several forums to address multilateral disarmament issues. The principal ones are the First Committee of the General Assembly and the UN Disarmament Commission. Items on the agenda include consideration of the possible merits of a nuclear test ban, outer-space arms control, efforts to ban chemical weapons, nuclear and conventional disarmament, nuclear-weapon-free zones, reduction of military budgets, and measures to strengthen international security. The Conference on Disarmament is the sole forum established by the international community for the negotiation of multilateral arms control and disarmament agreements. It has 66 members representing all areas of the world, including the five major nuclear-weapon states (the People's Republic of China, France, Russia, the United Kingdom, and the United States). While the conference is not formally a UN organization, it is linked to the UN through a personal representative of the secretary-general; this representative serves as secretary general of the conference. Resolutions adopted by the General Assembly often request the conference to consider specific disarmament matters. In turn, the conference annually reports on its activities to the General Assembly. The pursuit of human rights has been a central theme of the United Nations. World War II atrocities and genocide led to a ready consensus that the new organization must work to prevent similar tragedies in the future. An early objective was creating a legal framework for considering and acting on complaints about human rights violations. The United Nations is particularly concerned with the rights of minorities, refugees, women, children, and others who do not have a political voice. The UN Charter obliges all member nations to promote "universal respect for, and observance of, human rights" and to take "joint and separate action" to that end. The Universal Declaration of Human Rights was adopted by the General Assembly in 1948 as a common standard of achievement for all. In contrast to the development of the UN Charter, the declaration had more significant input from civil society. It is not legally binding and was not ratified by many nations, including the United States, because it is seen as an infringement on national sovereignty; however, it exerts significant moral force in international relations. The General Assembly regularly takes up human rights issues. Many nations were not satisfied with a voluntary declaration, and proceeded to adopt two Human Rights Covenants in 1966, whose observance was obligatory after ratification, which has been done by most of the nations of the world. The combined Declaration and the Covenants on Civil and Political Rights and Economic, Social, and Cultural Rights make up what is called the International Bill of Human Rights. In addition, the UN has adopted several important human rights treaties under which nations make specific commitments: the rights of women, elimination of racial discrimination, torture, children, and migratory workers. The UN and its agencies are central in upholding and implementing the principles enshrined in the Universal Declaration of Human Rights. A case in point is support by the UN for countries in transition to democracy. Technical assistance in providing free and fair elections, improving judicial structures, drafting constitutions, training human rights officials, and transforming armed movements into political parties have contributed significantly to democratization worldwide. The UN has helped run elections in countries with little democratic history, including recently in Afghanistan and East Timor. The UN is also a forum to support the right of women to participate fully in the political, economic, and social life of their countries. The UN contributes to raising consciousness of the concept of human rights through its covenants and its attention to specific abuses through its General Assembly, Security Council resolutions, or International Court of Justice rulings. In 2002, the International Criminal Court came into existence, whose development had been greatly shaped and hastened by civil society action. In April 2006, the UN General Assembly voted overwhelmingly to replace the United Nations Commission on Human Rights with the United Nations Human Rights Council. Its purpose is to address human rights violations. The UNCHR had repeatedly been criticized for the composition of its membership. In particular, several of its member countries themselves had dubious human rights records, including states whose representatives had been elected to chair the commission. The new Council has stricter rules for peacekeeping membership including a universal human rights review and a dramatic increase in the number of nations needed to elect a candidate to the body, from election-by-regional-slate on the 53-member Economic and Social Council to a majority of the 192 member General Assembly. In May 2006, elections were held to elect all 47 members to the council. While some governments with poor records were elected, such as Cuba, Pakistan, Russia, Saudi Arabia, and Azerbaijan, other rights violators that ran for election did not receive enough votes: Iran, Thailand, Iraq, and Kyrgyzstan. This change in membership has been cited as a positive first step for the council. There are now seven UN-linked human rights treaty bodies, including the Human Rights Committee and the Committee on the Elimination of Discrimination against Women. The Council's secretariat services are provided for six of those (excluding the latter) by the Office of the UN High Commissioner for Human Rights. The UN has been accused of ignoring the plight of people across the world, especially in parts of Asia, the Middle East and Africa. Examples cited include the UN's inaction toward the Sudanese government in Darfur, the Chinese government's Sinicization of Tibet, and the Israeli-Palestinian conflict. In the wake of the Rwandan genocide, the UN and the international community in general drew severe criticism for its inaction. Despite international news media coverage of the violence as it unfolded, most countries, including France, Belgium, and the U.S., declined to intervene or speak out against the massacres. Canada continued to lead the UN peacekeeping force in Rwanda, the UN Assistance Mission for Rwanda (UNAMIR). However, the UN did not authorize UNAMIR to intervene or use force to prevent or halt the killing. In conjunction with other organizations, such as the International Red Cross, the UN provides food, drinking water, shelter, and other humanitarian services to populaces suffering from famine, displaced by war, or afflicted by some other disaster. Major humanitarian arms of the UN are the World Food Programme (which helps feed more than 100 million people a year in 80 countries) and the United Nations High Commission for Refugees. Currently the UN High Commission for Refugees has projects in over 116 countries; over 89 million people are fed each year through the World Food Programme. The coordination of all of these efforts has worked unevenly in the UN system, and the secretary-general has proposed strengthening the role of ECOSOC in assuring that the multiple tasks are done effectively. The United Nations Development Programme (UNDP) is the largest multilateral source of grant technical assistance in the world. Organizations like the World Health Organization (WHO), the Joint United Nations Programme on HIV/AIDS (UNAIDS), and the Global Fund to Fight AIDS, Tuberculosis, and Malaria, are leading institutions in the battle against AIDS, especially in poor countries. The UN Population Fund is a major provider of reproductive services, also focusing on poor countries. It has helped reduce infant and maternal mortality in one hundred countries. Annually, the UN publishes the Human Development Index (HDI), a comparative measure listing and ranking countries based on poverty, literacy, education, life expectancy, and other factors. UN peacekeepers are sent to various regions where armed conflict has recently ceased in order to enforce the terms of peace agreements and to discourage the combatants from resuming hostilities, for example, in East Timor until its independence in 2001. These forces are provided by member states of the UN; the UN does not maintain an independent military. All UN peacekeeping operations must be approved by the Security Council. The founders of the UN hoped that it would act to prevent conflicts between nations and make future wars impossible by fostering an ideal of collective security. Those hopes have not been fully realized. From 1945 through 1991, the Cold War period, the division of the world into two camps—each with veto power in the Security Council—made agreement on peacekeeping matters extremely difficult. However, this was a period of general stability in which nations did not often wage war with each other. Following the end of the Cold War, there were many calls for the UN to become the agency to resolve disputes and end genocides within countries. This was not a mandate of the original charter which ratified national sovereignty. Nevertheless, the United Nations has sent troops into many nations to keep order based on the concepts of human rights and humanitarian intervention. UN peace operations are funded by assessments, using a formula derived from the regular scale, but including a surcharge for the five permanent members of the Security Council (who must approve all peacekeeping operations); this surcharge offsets discounted peacekeeping assessment rates for less developed countries. In December 2000, the UN revised the assessment rate scale for the regular budget and for peacekeeping. The peacekeeping scale is designed to be revised every six months. The UN Peacekeeping Forces received the 1988 Nobel Peace Prize. In 2001, the United Nations and Kofi Annan, then Secretary-General of the UN, won the Nobel Peace Prize "for their work for a better organized and more peaceful world." For participation in various peacekeeping operations, the United Nations maintains a series of United Nations Medals which are awarded to military service members of various countries who enforce UN accords. The first such decoration issued was the United Nations Service Medal, awarded to UN forces who participated in the Korean War. The NATO Medal was designed on a similar concept; both the UN Service Medal and the NATO Medal are considered international decorations instead of military decorations. The UN has not only acted to keep the peace but also intervened in armed conflicts, the first and most prominent instance of which was the Korean War. Peace enforcement is authorized under Chapter VII of the UN Charter, and can be undertaken when combatants refuse to accept peace. In Korea, based on a Security Council decision to aid South Korea after it was invaded by North Korea on June 25, 1950, 16 nations supplied military forces to the UN Command (led by the United States), and five additional nations provided medical units. The war lasted over three years, and ended in a stalemate, but the intervention of UN forces prevented South Korea from forcibly being reunited with the North under a communist government. Since that time, South Korea has become not only a democracy, but the world's 12th largest economy. Arguably, the case of Korea may be the UN's greatest success story in security matters. Historically, the UN has also supervised truces and monitored activity in buffer zones or peace zones (areas where norms are attempted to be established which limit the destructive effects of violent conflict). It has also called for certain regions with high-conflict potential to be zones of peace. However, another conception of a peace zone is as an area which serves as a model for cooperation between two enemies that can serve as the basis for future peace. The UN negotiates treaties such as the United Nations Convention on the Law of the Sea to avoid potential international disputes. Disputes over use of the oceans may be adjudicated by a special court. The International Court of Justice is the main court to adjudicate disputes among states. Since its inception, there have been many calls for reform of the United Nations. However, in recent years—especially with the new millennium—calls have increased from nations and civil society alike that UN reform is necessary for its survival. Clearly, some reforms would require a change in the UN Charter. For some nations, such as the Permanent Five in the Security Council, even proposed additions to permanent UNSC membership are hotly debated. For others in civil society, the issue is that "rearranging the furniture" already in the house is nowhere near the kind of reform really required by the UN. Conceptually, some NGOs frame the issue whether the UN should be the premier intergovernmental association or the preeminent international peace organization. That question addresses whether the UN should exist for the benefit of the members states and their national interests, or, with the growth of non-state actors in contemporary international affairs, whether civil society at large, seen transnationally, is ultimately whom the UN should represent and protect. If the answer is the latter, that the UN should focus on peace and not the needs of nation-states per se, then its structure should change significantly to match the reality of a changing world in which peace and security are multidimensional, with increasing input from non-state actors as well as from traditional nation-states. Excellencies, we have come to a fork in the road. This may be a moment no less decisive than 1945 itself, when the United Nations was founded. At that time, a group of far-sighted leaders. . . were determined to make the second half of the twentieth century different from the first half. They saw that the human race had only one world to live in, and that unless it managed its affairs prudently, all human beings may perish. So they drew up rules to govern international behaviour, and founded a network of institutions, with the United Nations at its centre, in which the peoples of the world could work together for the common good. Now we must decide whether it is possible to continue on the basis agreed then, or whether radical changes [emphasis added] are needed. And we must not shy away from questions about the adequacy, and effectiveness, of the rules and instruments at our disposal. He repeatedly urged members to seize a "once-in-a-generation opportunity" to reform the UN, or decisions avoided today will adversely affect this and future generations. Specifically, Annan said that among what needs to be examined is the "functioning of the major organs of the United Nations and the relationship between them" and recommendations of "ways of strengthening the United Nations, through reform of its institutions and processes." Among far-reaching suggestions for UN reform are: broadening of membership beyond nation-states to include non-state actors from civil society; and, the creation of a new UN interreligious body that would serve as an "upper house" to the General Assembly (and its executive arm, the Security Council). Representatives to this council should be ecumenical, regardless of profession, and able to further a universal, transnational vision of peace. Advocates of such a council say small but meaningful progress has been made in this direction beginning with GA Resolution 59/23, passed in November 2004, which noted the relevance of constructive interreligious dialogue and action to the prevention of armed conflict, and as a necessary basis for harmonious exchange and cooperation. Philosophically, proponents say, if the spiritual dimension of human affairs is not adequately considered in the UN and its activities, then the UN cannot comprehensively address the entirety of human affairs as they affect peace and security. Their argument is that it was when the global community was stirred to preserve and protect human life and dignity that the UN, and derivatives such as the Universal Declaration of Human Rights, came about. It is illogical, in this view, to exclude that dimension of human affairs, and most other proposals for UN reform fall far short of what is truly needed to make the UN effective and revitalized. Secretary-General Annan created the High-Level Panel on Threats, Challenges and Change, which issued a 2004 report containing over one hundred recommendations, but few that could be characterized as bold or far-reaching insofar as the UN's structure is concerned. The United States is open to UN Security Council reform and expansion, as one element of an overall agenda for UN reform. We advocate a criteria-based approach under which potential members must be supremely well-qualified, based on factors such as: economic size, population, military capacity, commitment to democracy and human rights, financial contributions to the UN, contributions to UN peacekeeping, and record on counterterrorism and nonproliferation. We have to look, of course, at the overall geographic balance of the Council, but effectiveness remains the benchmark for any reform. Federalism: This view advocates some degree of world government, imposed from the top down. The UN would act like a state, with the power to pass and enforce laws and to tax. This view is promoted by Citizens for Global Solutions (formerly the World Federalists) and articulated in the book World Peace Through World Law by Grenville Clark and Louis B. Sohn. There has been much fear that a world government would trump national sovereignty and become a world tyranny. Functionalism: This view believes that certain functional activities need international cooperation and standardization; for example, international aviation, international postal delivery and an international environmental protection agency. Ernst Haas's Beyond the Nation-State: Functionalism and International Organization (ISBN 0804701873) elaborates this view. Many of the specialized UN agencies, like WHO, operate in this way. Transactionalism: This view maintains that world organization will develop from the bottom up through the development of a world culture based on exchanges and transactions as people of different countries engage in commerce, travel, and forms of interaction. This view was articulated by Robert O. Keohane and Joseph S. Nye in Power and Interdependence: World Politics in Transition (ISBN 0316489360). Representation is a major problem for the UN. First, many member states do not feel that they are properly represented on the Security Council or in the General Assembly. Second, many peoples throughout the world do not feel they are represented at the UN. Security Council. The UN Security Council represents only 13 of the 192 member states, and among those 13, five have permanent membership and veto power. Most states feel they do not have a voice on the Security Council, the only UN organ with real military and police power to enforce its decisions. As the world power structure at the time of the UN founding recedes into the background, its structure decreasingly reflects world power realities. Many proposals to reform the Security Council have been offered, including regional representation, eliminating the veto power and permanent status of the five members, and increasing the size of the Security Council. There is a strong feeling that Japan (and perhaps India and Brazil) should become permanent members, but at the P5's insistence, without veto power. General Assembly. The membership of the General Assembly is composed of governments and there is no direct election of representatives by popular democratic means. The General Assembly gives every government one vote. Thus an island nation of 12,000 inhabitants has the same vote as China which has 1.3 billion people. Small nations can numerically overwhelm large nations and make decisions that can serve a few people at the expense of many. Proposals for reform include proportional representation based on population and a bicameral assembly. A Forum of State Leaders. As a forum for governments, many people feel the UN supports regimes, not people. In many nations, dictators represent only their own self-interest, or the interest of their ethnic group. Decisions that support such regimes are often viewed by oppressed peoples as collusion by the UN in oppression. In this view, while the organization can stand for international human rights in theory, its structure actually supports human rights violations in practice. Proposals for reform include increased recognition of NGOs and civil society, and parallel organs like the previously discussed interreligious council that would speak on behalf of the dispossessed and equal opportunity and justice for all people. Failure to act during the 1994 genocide in Rwanda, when then Secretary-General Kofi Annan oversaw peacekeeping forces there. Failure by the UN Mission in the Democratic Republic of the Congo (UNSC Resolution 1291) to effectively intervene during the Second Congo War, which claimed the lives of nearly five million from 1998–2002 (with fighting reportedly continuing), and in carrying out and distributing humanitarian relief. Failure to intervene during the 1995 killings in Srebrenica (Bosnia and Herzegovina), despite the fact that the UN designated it a safe haven for refugees and assigned six hundred Dutch peacekeepers to protect it. Failure to successfully deliver food to starving citizens of Somalia; the food was usually seized by local warlords instead of reaching those who needed it. A U.S./UN attempt to apprehend the warlords seizing these shipments resulted in the 1993 battle of Mogadishu. Failure to prevent the ongoing genocide in the Darfur region of Sudan, which reached its peak in 2003. 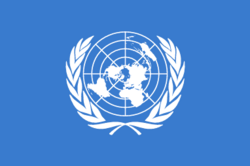 The extent to which the United Nations should act as a world government with more power to intervene in national disputes is under continuing debate, and relates to the issues of whether the UN Charter can be reformed or even a successor organization should be created. In 2005, the secretary-general proposed that the Security Council clarify the circumstances under which it would use force. Self-policing has been difficult at times for the UN. The nature of the General Assembly structure, with one vote per nation regardless of the size or qualifications of nations, has led to politicization of well-intended efforts. For example, the prior inclusion on the now-defunct UN Commission on Human Rights of such nations as Sudan, Cuba and Libya, which demonstrably have abysmal human rights records, and Libya's chairmanship of that commission, essentially stymied much human rights activity and made the commission itself illegitimate. The commission was replaced in 2006 by the UN Human Rights Council (see above). Is the process of change more effective through inclusion or exclusion? Do punishment and exclusion work or do alternate ways need to be found to "bring into line" those nations and leaders who scoff at international pressure? Should we be appealing to humanity's higher capacities by focusing on ideals sought and how to get there rather than digging again through problems and ascribing blame? What is the key methodology for the UN in its pursuit of peace? What resources are currently underutilized and ignored that need to be understood, included and strengthened? The nature of the above questions, highlighted by NGOs seeking more radical UN reform, point the way to solutions that include consideration of morality, ethics and the practical benefits of utilizing the moral authority of religions for peace. Lack of checks and balances and transparency within the UN has led to financial waste and scandals. An example is the Oil-for-Food Programme established by the UN in 1996 and terminated in late 2003. It was intended to allow Iraq to sell oil on the world market in exchange for food, medicine and other humanitarian needs of ordinary Iraqis, who were adversely affected by international economic sanctions placed on the government. The goal of the sanctions was to prevent the Iraqi government from rebuilding its military in the wake of the first Gulf War. The Oil-for-Food Programme was curtailed amidst allegations of widespread abuse and corruption; its director, Benon Sevan of Cyprus, was first suspended, then resigned from the United Nations after an interim progress report of a UN-sponsored investigatory panel led by Paul Volcker concluded that Sevan had accepted bribes from the former Iraqi regime and recommended his UN immunity be lifted to allow for a criminal investigation. Under UN auspices, over $65 billion worth of Iraqi oil was sold on the world market. Officially, about $46 billion was used for humanitarian needs, with additional revenue paying Gulf War reparations through a compensation fund, supporting UN administrative and operational costs for the program, and paying costs for the weapons inspection program. Also implicated in the scandal was then-UN Secretary-General Kofi Annan, whose son, Kojo, was accused of having benefited from illegally-procured UN Oil-for-Food contracts on behalf of a Swiss company. The existence of the UN as an over-arching global governmental organization has prompted many ideas about world government and world democracy. The UN is also often the subject of conspiracy theories, particularly attributed to the right, who maintain international elites aim to use the UN to effect global dictatorship. An educational activity, the Model United Nations, has grown popular in schools worldwide. Model UN programs have students simulate (usually) a body in the United Nations system, like the General Assembly, Security Council, the Economic and Social Council, the Economic and Finance Committee of the General Assembly, or the Executive Committee of UNICEF, to help them develop skills in debate and diplomacy. The United Nations has been depicted in several feature films. In the 1958 movie North by Northwest, director Alfred Hitchcock wanted to film in the UN, but did not receive permission; footage was secretly taken and UN facilities recreated on a sound stage. The 2005 film, The Interpreter, directed by Sydney Pollack, was the first movie permitted to be filmed on location inside the United Nations, in an effort to broaden international awareness of the UN. ↑ See Michael J. Matheson, Council Unbound: The Growth of UN Decision Making on Conflict and Postconflict Issues after the Cold War (Washington, DC: U.S. Institute of Peace Press, 2006, ISBN 978-1929223787), 62. ↑ Frank Donovan, Mr. Roosevelt's Four Freedoms: The Story Behind the United Nations Charter (New York: Dodd, Mead & Co., 1966), 119-143. ↑ “The United States and the Founding of the United Nations, August 1941 – October 1945,” U.S. Department of State. Retrieved January 2, 2017. ↑ Charter of the United Nations, United Nations. Retrieved January 2, 2017. ↑ United Nations Members States, United Nations. Retrieved January 2, 2017. ↑ With the exception of the Holy See (Vatican), the sole permanent observer state, all internationally-recognized independent countries are members. Other political entities, notably the Republic of China (Taiwan), Saharawi Arab Democratic Republic (Western Sahara), and Palestine, have de facto independence and/or some international diplomatic recognition from selected states, but are not UN members. ↑ Biography of Secretary-General António Guterres United Nations. Retrieved May 29, 2017. ↑ There are currently 137 NGOs in General Consultative Status, 1,780 in Special Consultative Status, and 952 on the roster. ↑ The UN Millennium Development Goals, United Nations. Retrieved January 4, 2017. ↑ Cf. Renewing the United Nations and Building a Culture of Peace: A Report from Assembly 2000 (Tarrytown, NY: Interreligious and International Federation for World Peace [now Universal Peace Federation], 2000; see esp. Dr. Sun Myung Moon's Founder's Address, "Renewing the United Nations to Build Lasting Peace." Retrieved May 29, 2017. ↑ For example, see An Urgent Appeal to Consider an Innovative Approach to Renewal and Reform of the United Nations (New York: International and Interreligious Federation for World Peace, June 24, 2005). Retrieved January 2, 2017. IIFWP [now UPF] is an NGO in special consultative status with ECOSOC of the UN. ↑ See “The Secretary-General Address to the General Assembly,” United Nations. Retrieved January 4, 2017. ↑ “59/23: Promotion of Interreligious Dialogue," United Nations (November 11, 2004). Retrieved January 4, 2017. ↑ “A More Secure World: Our Shared Responsibility,” Report of the Secretary-General's High-Level Panel on Threats, Challenges and Change, United Nations. Retrieved January 4, 2017. ↑ U.S. Priorities for a Stronger, More Effective United Nations, U.S. Department of State (June 17, 2005). Retrieved January 4, 2017. ↑ Paul A. Volcker, Richard Goldstone, and Mark Pieth, Independent Inquiry Committee Report on the Manipulation of the UN Oil-for-Food Programme October 27, 2005. Retrieved May 29, 2017. ↑ BBC News, “Oil-for-food chief 'took bribes,'” BBC News (August 8, 2005). Retrieved January 4, 2017. Donovan, Frank. Mr. Roosevelt's Four Freedoms: The Story Behind the United Nations Charter. New York: Dodd, Mead & Co., 1966. "U.S. At War - International." Time Magazine (May 7, 1945): 25-28. This page was last modified on 29 May 2017, at 21:15.